I’m a huge fan of salmon. Any way you prepare this fish I love salmon. 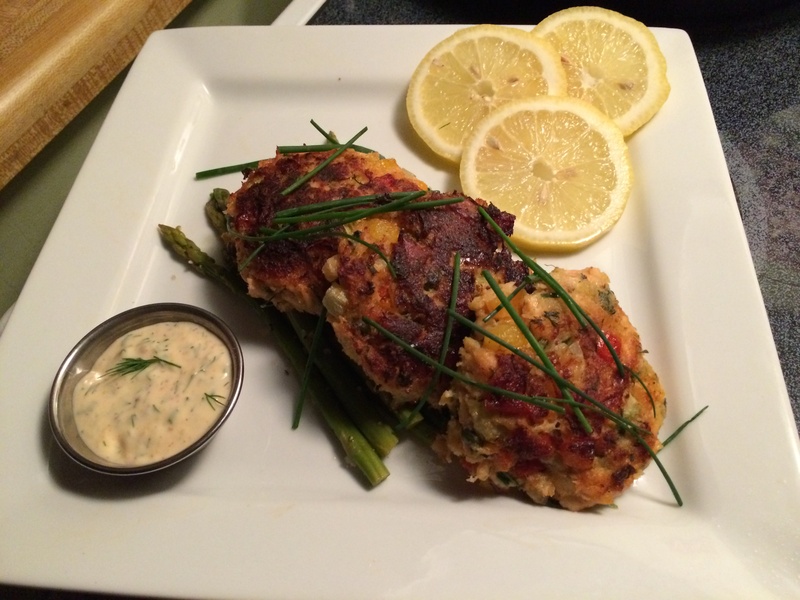 My Salmon Cakes With A Chive Dill Sauce is Steve and my favorite. Salmon pairs perfectly with asparagus so that was an obvious choice to go along with my Salmon Cakes. There’s a great recipe for Roasted Asparagus With Lemon Pepper on my site. The link will be posted below. How about Salmon Cake Sliders? Topped with peppery arugula and slices of avocado. These sliders are super delicious. In a bowl add the mayo and Dijon mustard. Add the lemon juice, grated garlic, salt, pepper, fresh chopped dill, and fresh chopped chives. Mix all the ingredients together, cover with plastic wrap and chill until ready to use. Preheat the oven to 350-degrees F.
Place the salmon on a sheet pan, skin side down. Drizzle a little olive oil, salt, and pepper, and bake for about 15-20 minutes, or just until cooked. When the salmon is done, remove and cover with foil and let rest for another 15 minutes. After the salmon has rested, transfer to the refrigerator until cold. This will allow the salmon to flake and come right away from the skin. You want to flake the salmon in large chunks, you really want to see the salmon throughout the cakes. In a large sautèpan, on med-low heat, using 2 tablespoons each of butter and olive oil, all the veggies, parsley, the seasoning, capers, Worcestershire sauce, Old Bay seasoning, 1/2 teaspoon of Kosher salt, and 1/2 teaspoon of black pepper. Sautè for about 15-20 minutes until soft. Coot to room temperature. Flake the chilled salmon into a large bowl. Add the beaten eggs, bread crumbs, mayo, Dijon mustard, the fresh dill, and chopped chives. Next, add the vegetable mixture and mix well. Cover and chill in the frig for 30 minutes. Using a small ice cream scoop, shape into 10 cakes, approx. 3-ounces each. Heat the remaining 2 tablespoons of butter and 2 tablespoons of oil, in a large sautèpan, over medium heat. In batches, add in the salmon cakes and fry 3 minutes on each side, or until golden brown. Drain salmon cakes on a paper towel lined plate. Transfer onto a baking sheet to keep warm in the oven at 250 degrees F.
Serve the Salmon Cakes With A Chive Dill Aioli Sauce hot. A ramekin filled with Chive Dill Aioli Sauce, and a side of Lemon Pepper Roasted Asparagus. Serve the Salmon Cake Sliders on buttered toasted buns with arugula and slices of avocado.